The ’80s? Stranger things have happened. 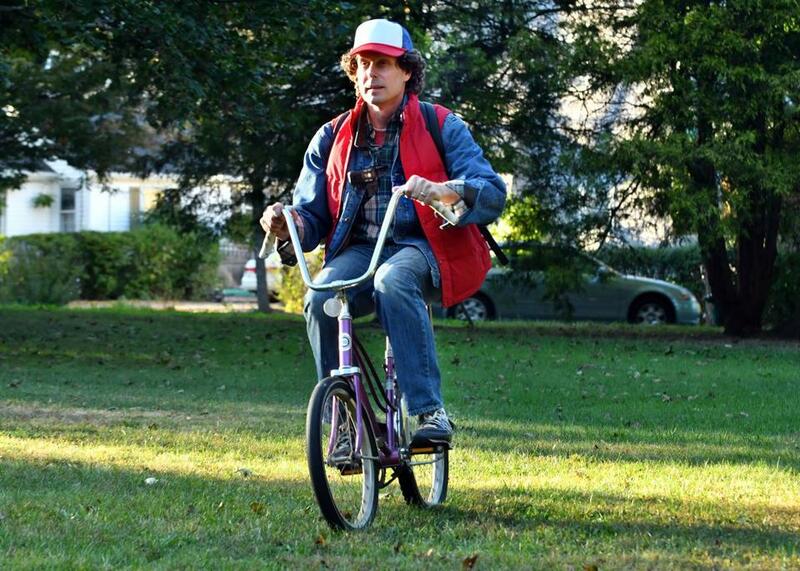 Ethan Gilsdorf rode a banana seat bike during his sojourn in the “Stranger Things” universe. I’m talking to my wife via old-school mobile communication — a walkie-talkie. I’m also sweating because I’m riding an old, kid-size chopper bicycle complete with banana seat while dressed in a vintage, checked polyester dress shirt, jeans, a jean jacket, and a red puffer vest like the one Michael J. Fox wore in “Back to the Future.” I’m also lugging a backpack crammed with three-ring binders and books, and a Pentax 35mm camera dangles from my neck. Why am I dressed like a middle-aged Marty McFly? Because I’m sojourning in the “Stranger Things” universe. Besotted by the first season of the smash Netflix series and egged on by the second, which debuts Friday, I’ve decided to inhabit for 24 hours the early 1980s, the period in which the show is set. I plan to immerse myself in the era’s pop culture, clothes, and technology — from New Wave and “Flashdance” and “The Breakfast Club” to mix tapes and Dungeons & Dragons. And I’m taking a few other “Stranger Things” devotees (some of them young enough to consider themselves historical reenactors) along for part of the ride. In case you’re not a fan, “Stranger Things” takes place in an Indiana town beset by strange goings-on, including the disappearance of a kid. The show is inspired by countless Spielbergian movies like “E.T.” and “The Goonies,” with a healthy dose of “Alien,” “A Nightmare on Elm Street,” “Poltergeist,” and Stephen King novels thrown in. In a world where adults are absent, oblivious or inept, it’s up to kids — including the bike-riding middle schoolers Mike, Lucas, Dustin, Will, and the telekinetic girl Eleven— to combat the supernatural, enter an alternate dimension called the Upside Down, and save the day. Like the show’s protagonists, I also came of age in the Reagan era. I want to relive that pre-Internet era when telecommunications meant rotary-dial phones, not data plans. When a screen was something that kept bugs out, when Snack Pack brand chocolate pudding came in cans. When nerd culture was born. My Sony Dream Machine clock radio bleeps like an incoming Russian missile warning from the movie “WarGames.” Like an alternate “Back to the Future,” I wake up some 35 years in the past. But it’s “Maniac” from “Flashdance” and trying to keep up with Michael Jackson’s “Thriller” and Jane Fonda’s workout cassette tape on the Walkman that truly get my blood pumping. Thanks to YouTube, I then spend an hour watching MTV videos such as Duran Duran’s “Hungry Like The Wolf” and A-ha’s “Take on Me.” I boot up an arcade game simulator on my laptop and blast my way through “Asteroids,” “Joust,” and “Robotron: 2084.” As for Rubik’s Cube, I couldn’t conquer it back then and can’t now. I’ve outfitted my basement with detritus from the period. My wood-paneled time capsule is tricked out with a couch, a gaming table, a TV/VCR, my old Super 8 film equipment, and a map of a famous D&D dungeon called “Tomb of Horrors” that I’ve painted on the wall. I reconnect my high school stereo and sort through musty tapes and LPs. Love calls: time to make a mix tape for my gal. Soon, just like the Billy Idol song, I’m dancing with myself. My tape includes the Police, Tear for Fears, Culture Club, Huey Lewis and the News, Cory Hart, Modern English, and Foreigner: “I’ve been waiting for a girl like you to come into my life.” Way better than Spotify. It’s time to exit the 1980s man/boy cave and seek adventure. I don a teal, blue, and burgundy striped shirt, green and yellow striped tube socks like Eleven’s, a genuine Members Only jacket, Dustin’s red, white, and blue trucker hat, and shades like Tom Cruise wore in “Risky Business.” As I hop on my bike I think of Elliott from “E.T.,” who says to his disbelieving mom, “There’s something out there.” The Upside Down. I want to relive that era when telecommunica-tions meant rotary-dial phones, not data plans. Entering nearby woods, I listen to the wind. But no mysterious sounds. Still, I’ve got no device to check. It’s liberating. Maybe the mystery I’ve been seeking is the whispering of my own mind. Soon neighborhood adults and teens gather in the ’80s cave. My visitors are game to throw on some spare garb from the era. We ask each other questions (mostly about the Soviet Union) from a period Trivial Pursuit game. We listen to Toto, Flock of Seagulls, and the soundtrack to “Repo Man.” We watch “Back to the Future,’’ drink Mountain Dew, and eat sausage and cheese pizza. For old-timers, “Stranger Things’’ has made it safe to return to that place and time whence nostalgic Gen Xers like me came. Re-creating the ’80s helped me understand what I missed most about those days. Taking the time to listen to an entire album and being present to create a mix tape. Gathering with folks, sans phones, to just enjoy each other’s company around the table. And I had this thought: If you take away Google and our ubiquitous screens, wander the woods on your bike, and let your mind wander, stranger things just might happen to you. Ethan Gilsdorf is the author of “Fantasy Freaks and Gaming Geeks.” Contact him at ethan@ethangilsdorf.com or on Twitter @ethanfreak.